It’s T minus 4 days and the pressure is on to get everything done before we hit the road. We’ve been doing as much training as we can between packing and programming. Greg, Nick, Nick’s friend Adam, and rode across the Golden Gate Bridge and into the Headlands on Saturday. The climb up was pretty steep, but once at the top we explored a tunnel complete with places for guns to protect SF. Once we made it to the other side there was a gorgeous beach calling our names. After that, we went back the flat way and had lunch in Sausalito and took the ferry back from Tiburon. Last night, after I left work, I decided to ride out to Walnut Creek for delicious dinner with my friends Aaron and Dana. 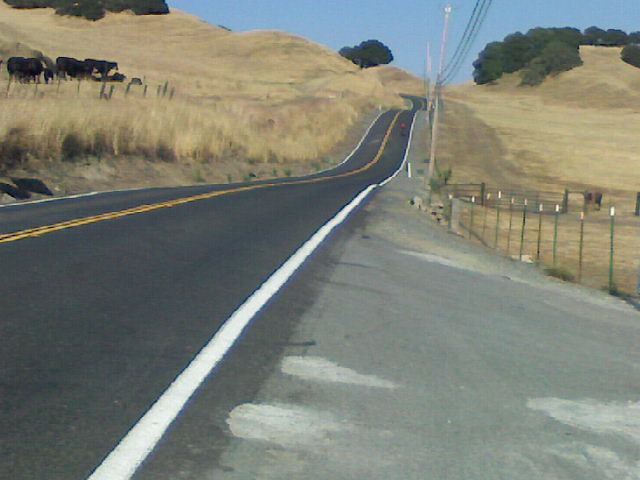 The ride up the Oakland Hills was pretty rough, but I made it! I went up Shepards Canyon Road, which has fewer switchbacks than the other roads, but the last 500 feet is super steep. I took my time going up. the downhill was lots of fun, but just at I was coming off one of the hills, I started to hear a clinking noise. Just as I was thinking about how I need to true my wheels before I leave, I looked down and noticed how wobbly my front wheel was. I had a pretty good guess about why that was, and when I stopped to check it out, I was right…broken spoke. That brings my spoke destruction total up to eight. At least for variety, this one was in the front. 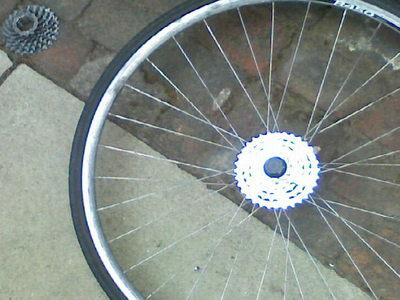 Anyone know how spokes in the front break? Greg and I are having a little going away party Thursday night, so e-mail if you are interested! Well, it’s very late and we are still packing! We had a very nice goin-away party for Greg, which involved him shaving off his beard and all his hair. He is hoping for less wind resistance. It’s been a long day of getting ready, but we’re almost there. We’ll be picking up the car very early tomorrow morning so that we can get ont the road first thing. We’ll be staying with Greg’s frind Vann in Seattle for a night, and then the adventure begins! Right now we’re in the stylish town of Winthrop. And luckily it has an internet cafe. We’ve spent the past couple of days without any cell reception. Yesterday was a very rough day. We spent almost all of it going up. We climbed for 27 miles to Rainy Pass, at an elevation of 4600 feet. Then we got a mile-long respite going down, only to climb back up again to 5477 feet at Washington Pass. Then, a very fast downhill to Mazama where we splurged on a delicious dinner at a local Inn. Interestingly enough, we have not yet paid for camping. We;ve also been pretty good about not eating out. We’ve bee carrying enough food for a couple of days at a time. It’s been super hot in Central Washington since we started biking. MOst places, it’s been hotter than it’s ever been in June. We’ve been taking lots of breaks and drinking tons of water to stay cool. Even though yesterday was hard, we started out the trip with a couple of easy days. Most of our first day was on a bike path. We’ll be going over three more passes, probably all in the next three days. Hopefully we’ll be in shape after the climb yesterday! We learned some trivia at a diner: More people are killed each year by champagne corks than by poisonous spiders. That’s good considering the showers (yay showers!) on the second day were full of spiders. We’ve been meeting lots of cool people, even a couple of tourists. We’re posting some pictures along with this update. Enjoy! Note from Greg: It should be noted that Megan is already attempting to shatter the record she set last year for most broken spokes. Other than that, our steeds have been holding up well. We’ve already been meeting lots of other bike tourists, with whom we’ve been swapping stories. This is a good sign, since it hopefully means I won’t get too lonely after I feed Megan to the bears in Montana. Ok – enough of this ‘internet’ – Bikebums….Ride On! Author meganPosted on June 29, 2006 Winthrop, WA204 miles ridden1 Comment on Wagons East! I just wanted to make a quick post since it’s been a little while since Greg has posted. I spoke with him very briefly just now, and he said he made it to Minnesota! I didn’t quite catch the town name, but he’s about 130 miles from Minneapolis, which means about a day and a half of riding. He also said it’s very very hot! I’m sure he’ll have a more extensive update soon. Keep on biking, Greg and Nick! Author meganPosted on May 13, 2007 Oakland, CALeave a comment on Training bums gotta eat! Me and Tasha and Greg just stopped by an internet cafe to make sure that everything’s going well in the cyber world. Greg and I made it to Prague after a very long day and a half of travelling. We decided to go the cheap and indirect route to Praha and took some local trains through Germany and the Czech Republic. All the towns we went through were impossibly cute! Our bikes made it just fime to Munich. We put them together in the airport and took them on the train with us, no problems. US Air lost my pannier (luckily I only checked one), but they claim they’ll deliver it to Tasha’s house. I’m keeping my fingers crossed. It’s been really exciting to travel around this place that’s new to us. A lot of people speak English, but we’re trying to interact with our minimal knowledge of Czech. We’ve seen lots of cool things, like giant Babylonian clocks, rad desserts, and lots of cobblestone streets. We made it back to Oakland only yo discover that out cell phone posts haven’t been working. Our phone said gesenden, but I guess it wasn’t really. We’re planning to write up the rest of the trip and post it soon, but in the mean time, we’ve posted our pictures in the gallery. Enjoy! 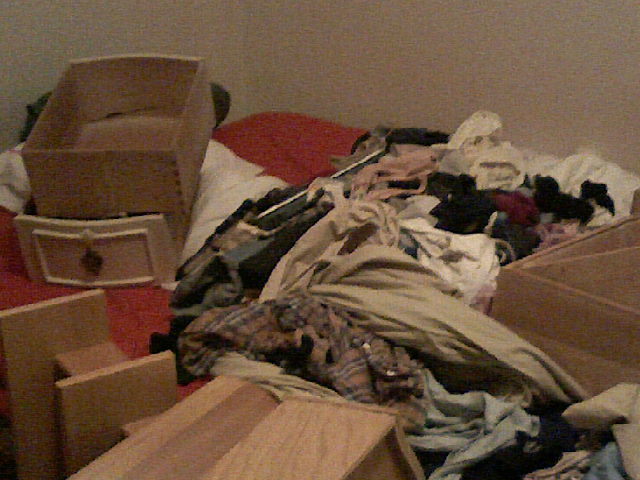 In the middle of packing, so we can get out of here!